On April13, 2019, we held our 10th Annual Allen Masonic Lodge Golf Tournament. Allen/Lovejoy Graduating High School Senior Student Scholarships. Cap and an autographed Blazing Saddles DVD signed by Mel Brooks. (Burton also signed the DVD). our 2018-2019 Community Builder Award. Birthday and Sweetheart Night at Henderson Kitchen & Tap. even though it was a quite cold (Someone had to take the picture). which was held in the Allen Events Center Saturday December 8th & Sunday December 9th, 2018. On Saturday, Allen registered 22 Donors, had 1 Double Red Cell Donation for a total of 23 units. On Sunday, East Fork registered 10 Donors, had 2 Double Red Cell Donations for a total of 12 units. Wow! Thank you Allen for your donations! Rountree and Story Elementary Schools. All the First Grade Classes get tooth kits to take home with them. even though the ground was still wet (Someone had to take the picture). Center in front of Staples. We saw plenty of rain which held down the number of Blood Donors. Thank all of you Allen Residents who braved the weather to Donate! 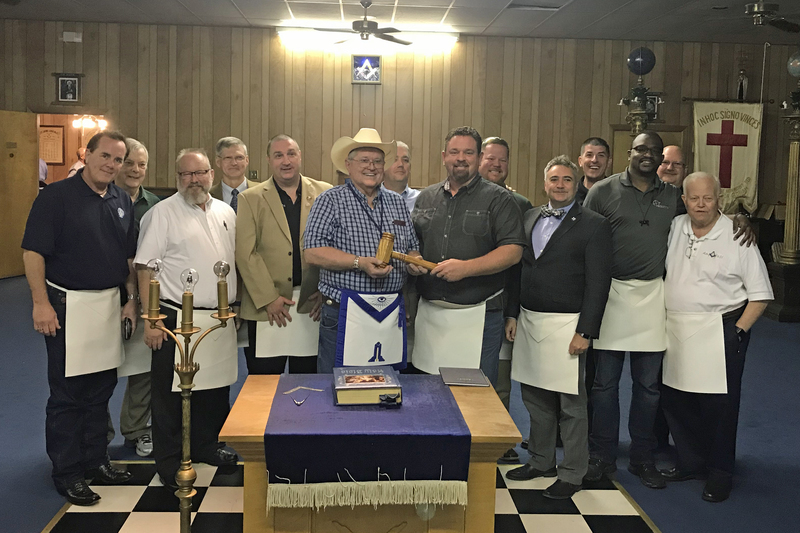 On October 2, 2018 Thirteen of us went on a "Gavel Raid" at St. John's Lodge No. 51. On July 28, 2018 ten of us worked to help "Keep Allen Beautiful" by Picking-up trash. which was held in the Allen Events Center Saturday July 21st & Sunday July 22nd, 2018. Whole Blood Units, and had 2 Double Red Cell Donations. directly impacted the lives of up to 126 patients. On June 23, 2018 fifteen of us worked to help "Keep Allen Beautiful" by Picking-up trash. 60 Year Mason Award Pin and Certificate. Museum, and part to the Shriners Hospitals for Children. During March 2018, 10 Allen Elementary Schools participated in the Scottish Rite Sponsored "Take Time to Read"
student with a Certificate of Achievement and Book Bag as their reward for reading. 3 patients. This means that you, the donors, directly impacted the lives of 54 patients. Wow! Thank you Allen for your donations! the funds needed pay off the Note! Family Christmas Dinner, and Desert/Cookie Decorating Contest. You have been instrumental in saving 63 lives.!!!! On Saturday, September 2, 2017 we held a "Gift of Life" Blood" Drive at the Allen Event Center. Thank you Allen for your donations!!! !